Books are typically manufactured in three different formats: soft cover, perfect bound, and dust jackets. Soft cover books are the most common book format and feature a printed flexible spine and covers. This is the most economical book publishing format that is commonly used for novels. Perfect bound books feature a printed hard cover that typically extends beyond the pages contained within. Perfect bound books offer a high-end look and feel that is suitable for publications including text books, limited editions, and more. Books manufactured in a dust jacket format typically contain a colored hard cover that is wrapped in a printed, flexible dust jacket. All book publishing formats benefit from lamination due to the added durability and enhanced look that a laminating film provides. Lamination helps protect the book’s exterior from smudging, fingerprints, and other abuse encountered during handling. Laminating films also give books a unique look, whether it is a glossy finish that makes colors stand out or a matte finish to impart a soft look and feel. 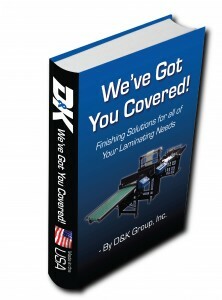 Book covers are most commonly laminated using an automated one sided laminating system. 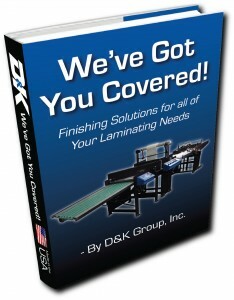 D&K recommends using a nylon laminating film for book cover applications due to its stable and non-curling properties. Additionally, nylon films shrink and expand at the same rate as the paper cover. 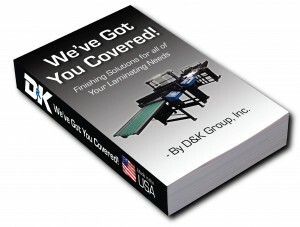 For the ultimate high-end book finish, use a Nylon, Diamond Hard Velvet Matte laminating film. This finish offers a scuff resistant matte surface with a soft velvet feel that is suitable for publications of all types. Diamond Hard Velvet Matte products are also UV and spot varnish receptive, foil stampable, embossable, and gluable. Despite the popular saying, people do judge books by their covers. Utilize D&K’s Diamond Hard Velvet Matte laminating films for a truly memorable finish.